Zipper pouches perfect for carrying alone or in a larger bag, to help corral make up, art supplies, toiletries, school supplies and more! Available in different sizes and materials, we also offer personalized options made in the USA! 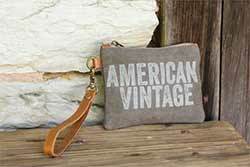 American Vintage Wristlet - Bring just the essentials with this fashionable wristlet, made of recycled canvas for a classic vintage look! Special Order. 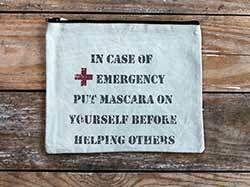 Perfect for tossing in a larger bag when you're out in about. 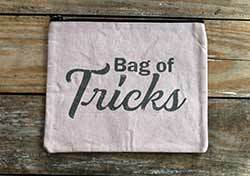 This one is soft pink and reads: "Bag of Tricks." 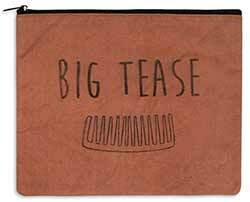 Perfect for tossing in a larger bag when you're out in about, this bag features screen print image of a comb, and reads "big tease." 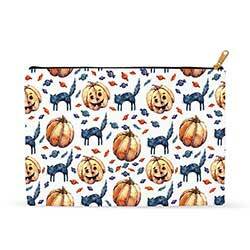 This zipper pouch features watercolor artwork of black cats, pumpkins, Jack o'Lanterns, and tiny candy - great for Halloween! Available in your choice of two sizes. 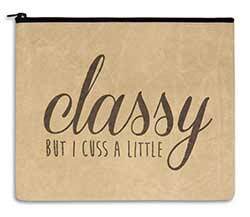 Perfect for tossing in a larger bag when you're out in about, this little bag is distressed tan, and reads: "Classy but I cuss a little." 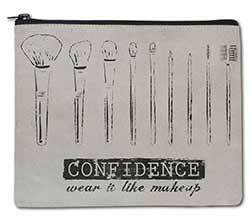 Travel in style with this vintage style canvas pouch, perfect for make up, art and journaling supplies, or toiletries. This one charcoal gray with small brass studs, and reads: "Don't be a tourist, be a traveler." 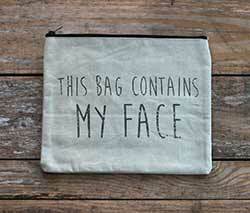 Perfect for tossing in a larger bag when you're out in about, this bag features screen print quote, humorously reading "This bag contains my face." Perfect for tossing in a larger bag when you're out in about, this little bag is distressed beige, and reads: "I'm still hot, it just comes in flashes." 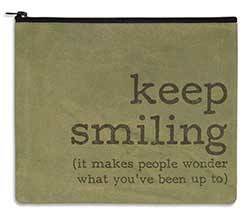 Perfect for tossing in a larger bag when you're out in about, this bag features screen print quote "Keep smiling, it makes people wonder what you've been up to." 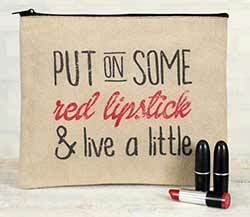 Perfect for tossing in a larger bag when you're out in about, this bag features screen print quote, humorously reading "Put on some red lipstick and live a little." 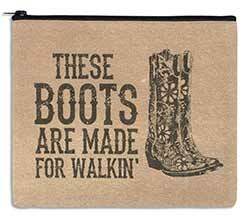 Perfect for tossing in a larger bag when you're out in about, this features a vintage-style screen print image of cowboy boots, and reads "These boots are made for walkin'." 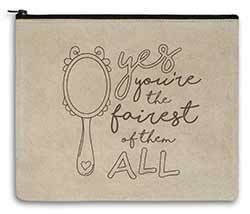 Perfect for tossing in a larger bag when you're out in about, this bag features screen print image of a hand mirror, and reads "yes, you're the fairest of them all."